Kalmar, part of Cargotec, is set to launch its highly acclaimed G-generation reachstackers, named Gloria, into the Asia-Pacific region. The much anticipated entry into APAC follows the successful introduction to European markets, where Kalmar's fifth generation reachstackers have been setting new standards in cargo handling performance. The launch will take place on 26 August in Shanghai, China. With thirty different Gloria models available, Kalmar offers the industry's widest range of reachstackers to meet all types of cargo handling applications. Developed to meet the critical demands of container, intermodal, barge and industrial handling market segments, Gloria provides the benchmark for productivity, operator comfort, safety and cost-efficiency. The ever-increasing focus on ways to reduce the cost of ownership has resulted in Kalmar setting the benchmark with a market-leading solution. Gloria not only takes productivity and fuel-efficiency to new levels; with a total lift capacity of 45 tonnes and capability to stack up to 6 high (5 high on the intermodal); but is also the most fuel-efficient reachstacker on the market. A choice of three ECO driving modes; power, normal and economy; means that up to 20% fuel savings can be achieved. The automatic stop/start function can also result in a 10% fuel saving and a reduction in emissions. 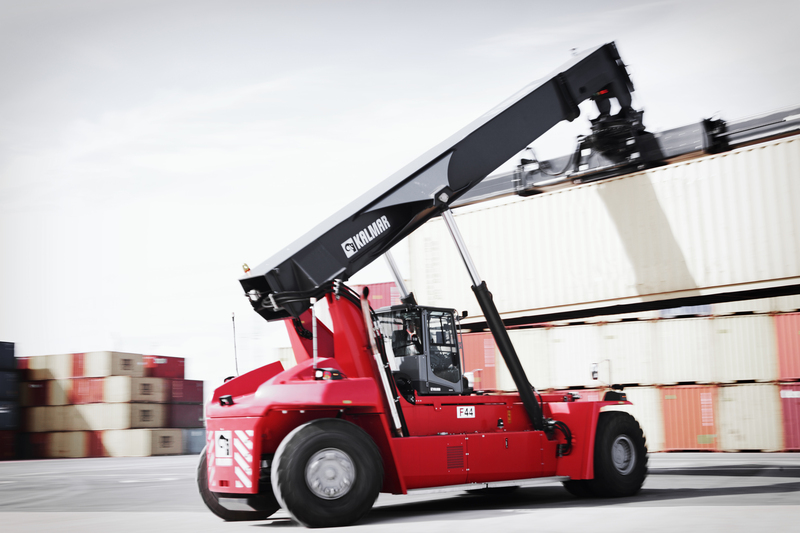 Kalmar believes that increased comfort and safety contributes significantly to operator productivity. With Gloria's technology delivering the ultimate operator experience, safety standards have been considerably improved. An example is the reverse aid warning and personal proximity safety systems. Gloria can be equipped with external sensors and a reversing camera integrated into the rear counterweight. Covering an area from 50cm up to 9m, the system provides a warning via an ultrasound and an interior display, should it detect an obstruction or person close by. Safety is further improved with a new optional automatic fire suppression system, fire alarm and fire extinguisher. The engine and transmission compartment system is based on high pressure water mist that can be recharged. The fire suppression system also works as a fire alarm with a warning lamp inside the cabin. 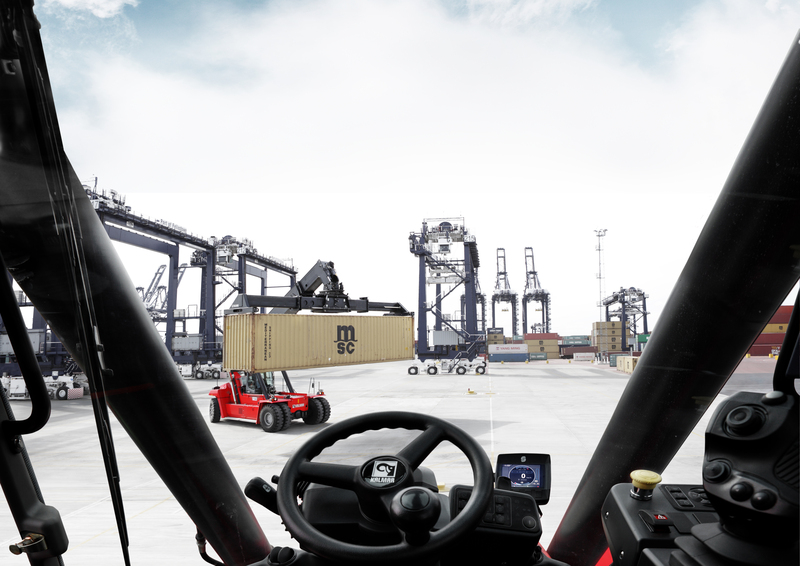 Adding to an impressive list of features, Kalmar's patented side tilting steering wheel and specially designed joystick control also contribute to making Gloria the most operator-friendly reachstacker on the market by reducing fatigue, improving manoeuvrability and enhancing productivity. Furthermore, the cabin offers over 90% guaranteed all-round visibility, even in the worst weather conditions. It features a head-up display with LED indicator, electronic climate control adjustable for different environmental conditions and a human machine interface, all of which combine to improve the operator experience. Kalmar has also introduced radical changes to the service intervals and, as a result, calculated significant cost savings across many of the service related intervals. A two-year or 4,000-hour warranty now comes as standard; the first machine service has been extended from 50 to 500 hours and the hydraulic oil change interval extended from 2,000 to 4,000 hours or more with the Oil Sample Programme. Engine oil servicing is now also extended from 500 to 1,000 hours and the servo filter from 500 to 1,000 hours. Dan Pettersson, Senior Vice President, Mobile Equipment at Kalmar, "We are very much looking forward to launching Gloria into the Asia-Pacific region. Of course, APAC is one of the most competitive markets for this type of equipment. However, given the success we have experienced in other parts of the world, we are confident that Gloria will quickly establish its credentials and popularity. This machine is without doubt a milestone in reachstacker design with numerous features that enhance productivity and significantly reduce the cost of ownership." Stefan Johansson, Director, Sales and Marketing, Kalmar Reachstackers and Empty Container Handlers, added: "Kalmar continually invests in developing not only our products but also our customer support services. The quality of our reachstackers is reflected in the remarkable team that supports our equipment around the globe. As we now turn our attention to the opportunities presented in key markets like China, we will deliver the same commitment to help our customers run their businesses efficiently and profitably."